Miranda Ward delivering the opening paper at “Texts in Place/Place in Texts I”. For geographers and literary scholars, place is both a significant intellectual focus and an important organisational concept. In its various guises, place is something captured by, and responded to, in texts; it is where texts are written and where they are read. Place, in various ways, is also tangled up with memory and identity. 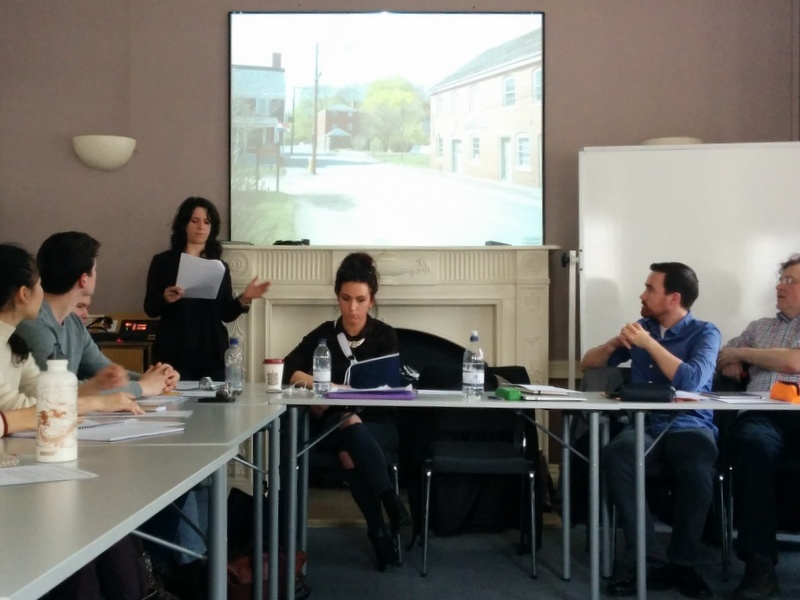 This special session of Landscape Surgery—organised as part of the HARC Fellowship strand on “Cultural Participation in Place”—brought together postgraduate geographers and literary scholars to discuss the question and significance of place. The Department of English was represented by Ben Felderhof, whose research concerns the representation of the jungle in British fiction, and James Cutler (co-supervised in the Department of Media Arts), whose work investigates the dominant position of place in the cultural memory of Charles Dickens, the Brontes, and Thomas Hardy. The Department of Geography was represented by Miranda Ward, whose work has examined creative approaches to writing place, and Katie Boxall, whose research concerns the cultural geographies of dyslexic creative writing. The session was convened by Finn Fordham (English) and Innes M. Keighren (Geography). It is to be followed by a one-day symposium—“Texts in Place/Place in Texts II”—at Royal Holloway on 21 May. In what follows, the speakers summarise (in the order in which they presented) their contributions to the session. My paper examined the role of writing in geographical scholarship about place, focusing particularly on the potential to use “creative-critical” forms of writing to explore relationships between body and place through engagement with both the physicality of the act of writing as well as the spatiality of the text. This kind of writing was loosely defined as being characterised by personal modes of authority, a playfulness with language, and /or an experimentation with form and structure; I then framed my argument through reference to my own research on swimming bodies and the pool, suggesting that while there may be an especially noticeable tradition of using writing as a tool to explore the active male body in place, thinking of the body as a “recording machine” in the field (Dewsbury 2010: 327), or “something through which research is […] done” (Crang 2005: 232) allows us to consider the potential of writing to engage with as many kinds of bodies as there are scholars and writers, performing various duties and activities in various places. Crang, M. (2005) ‘Qualitative methods: there is nothing outside the text?’, Progress in Human Geography, 29(2), pp. 225–233. Dewsbury, J. D. (2010) ‘Performative, non-representational, and affect-based research: seven injunctions’, in DeLyser, D., Herbert, S., Aitken, S., Crang, M. and McDowell, L. (eds) The SAGE handbook of qualitative geography. London: SAGE, pp. 321–334. In summarising some of the background research I have conducted as part of my thesis on the tropical forest in British fiction, c.1885–1914, my paper attempted to relate a brief history of arboreal settings in European literature. I argued that, since ancient Greek philosophers first used the word for ‘uncultivated woodland’ to represent primordial chaos, forests have been used to substantiate conflicting views about the nature of the universe and humanity. On the one hand, Christian writing depicted existence outside God’s law as a dark, disorderly and savage tangle, which tends towards order and benevolence in accordance with divine influence. In texts influenced by materialist ideas, on the other hand, there is no meaningful development of the forest, only a deterministic cycle of creation, destruction and re-creation. My overall aim was to establish that the proliferation of jungle stories during the late-nineteenth century was due in part to a dispute arising from Darwin’s theory of evolution, between those who clung to a teleological view of the world and those who accepted the somewhat bleak implications of natural selection. Cultural geographies of dyslexic creative writing practice: a place for mindful pageness, or a page for mindful placeness? In this paper, I presented selected conversations between four practising dyslexic creative writers, illustrating ideas of more-than-page exchange, processual creative writing, and the literary habitations/habits evident in how writing takes place. The conversations were between a dyslexic poet, a dyslexic scriptwriter, a dyslexic personal experience narrator, and my own dyslexic autoethnography practice. My paper sought to highlight the messiness, and associative transcending facets, which cyclically ferment in what it means to write and be a writer. Through extracted tales, visual ethnography, and conversational interview extracts, I exemplified how these writers narrate within, beyond, and neighbouring the parameters of the page. My paper explored the key link between Dickens’s unrivalled enduring popularity and cultural legacy and place. More specifically, it focused on Oliver Twist (1837–9)—Dickens’s second-most-popular and culturally pervasive text after A Christmas Carol—and the text’s depiction of London; it then investigated the way in which Dickensian London had been sustained and shaped in a twenty-first-century cultural remediation (specifically through a Lloyds Bank television advert from the autumn/winter of 2014–15). The first part of the paper discussed Dickens’s original textual aesthetics of, and affective and fictive relations to, urban place. Mostly focusing on Oliver’s initial immersion in London (and the reader’s first experience of it) in Chapter VIII, the paper examined Dickens’s use of dialectical macro and micro montage as a means of reflecting late-1830s urban experience, and crucially contributing to the powerful resonance of London in the text to which the reader is drawn imaginatively and affectively. The second section explored the most recent mass cultural permeation of Dickens’s text: Lloyds Bank’s television advert which featured two clips from Carol Reed’s 1968 musical film, Oliver! Concentrating on the representation of Dickensian space and place in the two clips, the paper proposed a number of tentative suggestions about what this indicated about Dickens, Dickensian place, and us today.